Over the past couple of weeks, there has been an excellent series of articles celebrating the 20th anniversary of Andy Hampsten’s win in the 1988 Giro d’Italia, starting with the grueling stage over the Passo Gavia, in which Hampsten finished second on the day (behind the Netherlands’ Erik Breukink), but with the maglia rosa of the overall leader, which he held until the conclusion of the Giro several days later. I’m actually surprised the Reverend Big Ring hasn’t posted a sermon about this yet … but he has been busy finishing the new chapel and preparing to move his wisdom from the Hells to the Golden ones, if all goes well … so I find myself in the position of leading the prayer service. was frozen, yet not buried by snow. The fourth day He arose again in the mountains. in the manner of the Cannibal Merckx. 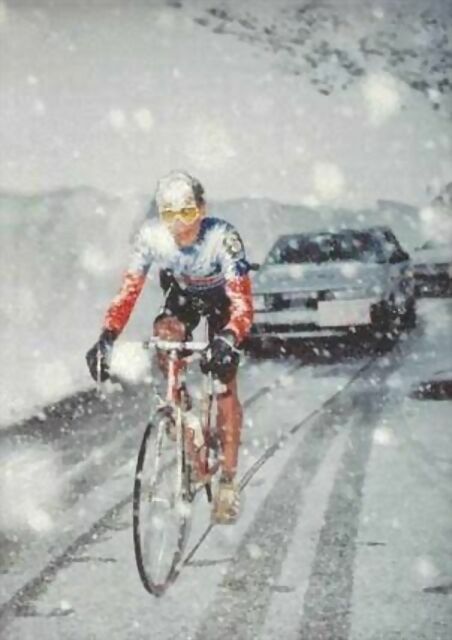 Then go to Cyclingnews.com to read Cold comfort: Hampsten’s day on the Gavia.